If you want your readers to understand what you’re saying, then don’t put barriers in their way. The most common obstacles to understanding include poor punctuation such as errant apostrophes, incorrect spelling, nonsensical structure and long-winded sentences full of abstract nouns. It’s any error that causes the reader to stop in the middle of a sentence, pause to read something twice or ponder the meaning of what has been written. Classic gems such as ‘it was a barmy evening’, ‘the reader begins to loose interest’ and ‘suspects on the lamb’ show how easy it is to confuse readers. Do you really want your work to be ridiculed? Today, a gaffe can be shared with the world in just a few seconds – and then be out there for ever more. There’s nowhere to hide, whether you’re caught by punctuation crusaders like Twitter’s Apostroph3woman or experience the ultimate humiliation of having your publication trashed on national TV in Have I Got News for You. Always get your copy proof-read to reduce the risk of this kind of bad publicity. Asda used a possessive apostrophe on a Father’s Day T-shirt, triggering a flurry of angry responses on Mumsnet. Or what about this billboard gaffe. Published in 2016, it is still doing the rounds. A sub-editor or proof-reader would have checked the number was right before it was printed. Remember, your error could be fair game everywhere in the world – forever. Businesses must build the trust of their customers and clients – and the simplest way is to give them correct information that they can rely on. And that starts with the facts. It’s not just about errant apostrophes or an annoying overuse of exclamation marks! One wrong figure in a postcode, for example, could have your customers turning up at your competitor’s offices. Writing a set of instructions but accidentally missing out steps five and six, means your customer can’t finish that DIY project. And if that marketing report is too boring, who’s going to finish reading it? We’re used to people boycotting unethical companies. Now, how about groups that boycott businesses that can’t handle basic English? That’s the aim of the Facebook group The Apostrophe Police. The Grocer’s Apostrophe irritates them – a lot. It’s where apostrophes are used incorrectly in plural words like apple’s and pear’s. Incidentally, I never go to a garage that offers MOT’s – if they don’t care about an apostrophe, what are they going to do about my brake pads? Ask yourself, do you want to risk losing any business, however small, over something as easy to correct as an apostrophe in the wrong place? If your marketing material contains a mistake, it implies that you’re slapdash in other ways as well. Why would anyone buy from you? You’re laying yourself open even more if you advertise yourself as having an eye for detail or being fastidious, meticulous or thorough when your copy shows you’re not. Schools today place a massive emphasis on good grammar and punctuation. Students who have benefited from this are becoming hotshots in the workplace – and they’re your competition. Make sure you can keep up with them. Some errors are potentially dangerous. They could even result in you facing a court case or being considerably out of pocket. Libel and factual errors can all get you into hot water with the law. Earlier this year, a woman was left with a £200,000 legal bill after libelling her ex on Facebook. Good sub-editors are also aware of libel law! And, of course, the wrong advice in a medical book could put someone’s life or future happiness in jeopardy. Factual errors can slip in inadvertently – and even small slip-ups can lead to disastrous, unintended consequences. For example, when reporting court cases, newspapers generally use the terms ‘admit’ or ‘deny’ rather than ‘guilty’ or ‘not guilty’ because the risk of losing the word ‘not’ is too high. Proof-readers or sub-editors are experts in grammar and punctuation and they also know common mistakes to look out for. They not only fact-check copy, but also ensure it is easy to read. Subs and proof-readers can suggest different sentence structures or choose better words to highlight your message and sell it in an even better way. These experts are the fresh pair of eyes that read your words before your client or customer does. Clear, concise and accurate copy is the key to communicating your message to clients. Showing you care about getting it right, demonstrates that you care about the rest of your business. Remember, to err is human. 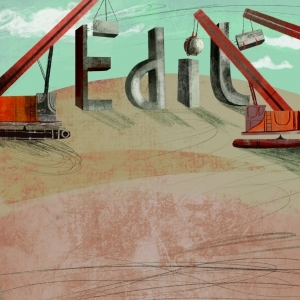 We all make mistakes – always have your copy proof-read by a professional editor. Thank you, Tessa Evans, for casting your expert eye over this!